Knowledge as understood through doing. Skateboarding – asking why is this ‘not meant for me’? Asking how do I present myself as gendered? 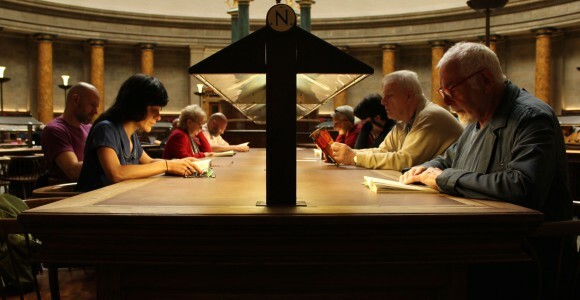 Quarantine’s The Reading Room – performed in the stunning Wolfson Reading Room at Manchester’s Central Library on 14th Nov 2014 – was a delightful event and a performance that connected on different levels with the site and the people in attendance. If you’ve never been to the Wolfson Reading room I really recommend it. It’s in the core of the circular library building, and the enormously high ceiling has a glass dome in the centre with golden lettering surrounding it that reads, ‘Wisdom is the principal thing; therefore get wisdom; and with all thy getting; get understanding’. The room has a particularly interesting acoustic quality. It seems to amplify and deepen tiny sounds, sending them scattering across the space, such that miniscule movements become like the sound of thunder on the other side of the room. In the room are 28 large desks, each with a central strip of lamps that produces a focused, strong beam ideal for reading by. A performer was sat at each of these desks, with several sheets of plain paper and a schedule of the events that would happen throughout the performance. Audience members were invited to sit at any of the desks and could move desks at any time. As people swarmed into the room at the beginning of the performance there was a period in which people were deciding where to sit and scoping out the different performers. A map of the space had been provided, which detailed who was sat at each desk and a text that they would be reading. Slowly, this chaos settled down, as people committed, for now, to a particular performer and desk. The first part of the piece involved the performers trying to memorise all the books they had read and to write down what they could remember on sheets of paper, which were littered across their table for audience to read. It was enjoyable to glimpse into the literary history of the performers and to see what they thought about books that I had also read. The last two parts of the performance involved the performer reading a text that was important to them, and finally the performers read the same text, in unison, whilst they remained at their own desk. I liked the way that the performance responded to this unusual space – each performer at a glowing desk appeared like a little galaxy and we were invited to orbit and settle. I wasn’t much in the mood to be static (am I ever?) so I found myself orbiting a lot, and looking in on these galaxies. Some of only two people, heads together, deep in conversation that I didn’t want to interrupt; some groups of eight or more, chipping in to a conversation about a book or an experience of reading. I loved the way the performance created spaces for discussion between strangers, and spaces for thinking about your own experiences of reading. I also liked the way the performance responded to the idea of a ‘reading’ room; Incorporating the activities of reading quietly, reading out loud, and of reading into people’s comments and thoughts. The performance seemed to suggest that our bodies are vessels containing all the books we have ever read, and that we are filled with experiences and knowledge. The Reading Room was a moment of telling tales to each other, conveying anecdotes and the passing on of bodies of wisdom. I’ve been thinking about these terms a lot recently. They relate to my research on gendered play in the public built environment. 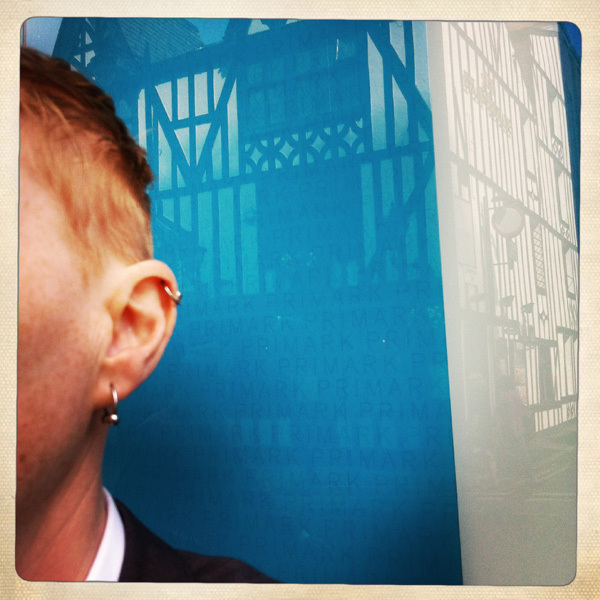 For the past six years I’ve been engaged in a practice-as-research project that involves me going into town and making playful use of street objects, paving, railings and other things. I have performed this work in places where there are no people around and where there are lots of people. I have performed in Manchester, Leeds, Liverpool, Chester, Rugby, London, Bristol and Sheffield. For this practice I wear a dress, which has developed over time, but is best described as something in a style that is reminiscent of fictional girl/woman characters. It is a sort of fairytale dress with puff sleeves and a full skirt. The fabric of this costume is grey cotton, referencing the generic outfit of city workers, and having connotations with uniformity, blending in, and the seriousness of a work environment. I play ‘like a child’, but I avoid this identification because the activity is really a reclaiming of the act of play for an adult, and a woman. We human beings are players. Simple, improvised, spontaneous play is not merely something that children should do. For me, the city is a social forum, a place that has been built by people and in which people’s lives play out. Practices of this urban place are like flows of social information; what people wear, how they move, and how they behave speaks to you. It is a flow of telling what is expected, what you can do and what you can’t. And the flow of information coming from the city is increasingly commercial. Our movements in the city are focused around the smooth transacting of money or the productive movement of workers to and from places of work. My performances are an interruption. They aim to disrupt the flow of dominant social information. I am an interruption as a woman who plays, and I am being unproductive and non-commercial in this space. I don’t invite participation, but sometimes people join in with me, talk to me, and shout things at me. They interrupt or modify my flow in their own ways. I always liked the idea of interruption because it doesn’t imply any kind of fixing of a problem (like intervention does) and the necessary privilege and authority that goes along with that. It simply points to another possibility or perspective, representing a different voice in the milieu of social soliloquies. During the summer I became involved with a project by artist Hannah Leighton-Boyce, which was centred around Helmshore Mills Textile Museum and the local community of Helmshore in Rossendale, Lancashire. Helmshore Mills Textile Museum was once the site of two cotton and wool production mills. The Museum is wonderful – there is a wealth of historical information and really fascinating demonstrations of the machinery. For Hannah’s project she became fascinated by a particular part of the production process – the carrying, hanging and drying of huge folds of fabric on tenter frames, which were located on the fields at the back of the mill. This would have been a group activity for mill workers, and the massive tenter frames hung with fabric, sitting 70-feet wide on the landscape, were said to have looked like huge sails. The area of land used as tenter fields is now a housing estate. Hannah was donated an old aerial map of the area, which also mapped the lines of the tenter frames across the landscape. From this map, she worked with the people of Helmshore, and particularly the people living on what were the tenter fields, to map the placement of the old tenter frames through their homes and gardens. Hannah’s idea for The Event of the Thread was to spin dozens of metres of woollen thread – made with wool from Helmshore sheep – and to work with the local community to pass the thread along the lines of the former tenter frames and through people’s homes and gardens, after which participants, neighbours and visitors gathered for a Jacob’s Join – a Lancashire term for a pot-luck buffet. The Event of the Thread was a wonderful project to experience. It took several months of preparation, and relied heavily on the generosity of the local community. Their interest in connecting with the history of the landscape, through bringing stories and objects relating to the mill that had been passed down through the generations, and their help and enthusiasm in organising and completing the final punctuating event. I was particularly drawn to the project because of the way it approached social engagement by making connections with people in the local community and from the community to the shared history of their landscape. > voice / power > activist? Whose language? Does artist’s language adapt/ become sensitive to participants’ and vice versa? > Where does the ‘need’ come from? ..What is your heart’s desire? We can also be immersed in our own self practice – NOT be socially engaged. The Bed exhibition brings a group of artists from the North West, Yorkshire and internationally, who each respond individually to the exhibition’s title Bed. An open conversation about socially engaged performance practice taking Spanton’s work (Slices / Seams) in Bed as a starting point, led by Interactions artists Sarah Spanton, Dani Abulhawa and academic and researcher Sarah Amsler (see below for more info about Sarah Amsler). Got to http://www.waymarking.org.uk/current_5.php – for more info about Slices / Seams. She is interested in three questions. First, how does the political and economic organisation of cultural work, particularly in education and art, impact upon the nature and possibility of transformative social action? Second, how do cultural practices work to open democratic and emancipatory political forms and possibilities, and to close them down? Most importantly, what roles do different forms of education play in these processes? She has studied these questions in different contexts, including the role of public history and museums in the United States, the politics of social science in post-socialist Central Asia, and most recently problems of formal and informal education in the UK and globally. Theoretically, this question weaves its way through debates around utopian epistemologies in critical theory, philosophies of ‘crisis thinking’, prefigurative politics, affective theories of critique and transformation, and various articulations of the relationship between aesthetics, politics and pedagogies. 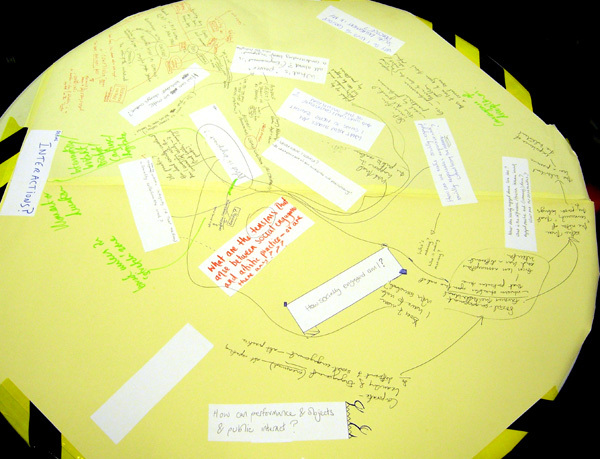 The table I was on was tasked with constructing a landscape of socially engaged performance practice. We drew pictures of our city, added people and buildings, a canal system, and we looked beyond at the outskirts, the rural areas, and the margins. 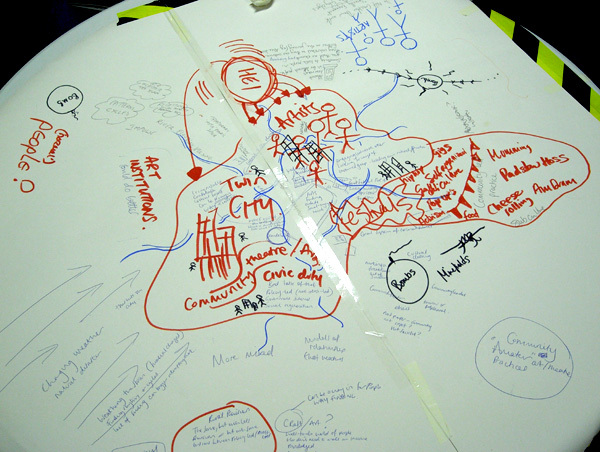 The first group tackling the landscape task set out a twin-city consisting of artist-driven projects on one side, and policy-led or institutionally driven projects on the other. There was a sense of tension between these two approaches, but a canal system was added to represent the strands of personal politics that connect and divide these two cities. The second group talked about how the weather affects this city, and drew lines representing wind and rain hitting the city. The weather tended to symbolise wider political decisions that impact upon the landscape of socially engaged performance practice, particularly the ‘natural disasters’ of funding cuts. One participant talked about ‘weathering the storm’ of financial changes, but also acknowledged that a lack of funding and inclement weather can trigger interesting approaches to the creation of performance work. We discussed the rural outskirts of the city – both in terms of a metaphorical rural or Edgelands, and the actual rural provision for socially-engaged performance practice. Many of the participants felt the same kind of tensions existed between artists and policy makers as those seen in urban areas, but on a smaller scale. The issue of rural provision raised a point about craft in relation to art. Craft-based projects were seen as a way to make community art accessible. Later on in the discussion several people talked about the need to provide a way in for people, to the world of performance and art, and how recognisable and comfortable cultural and artistic forms can be a good way to bring people into a process they are unsure about. 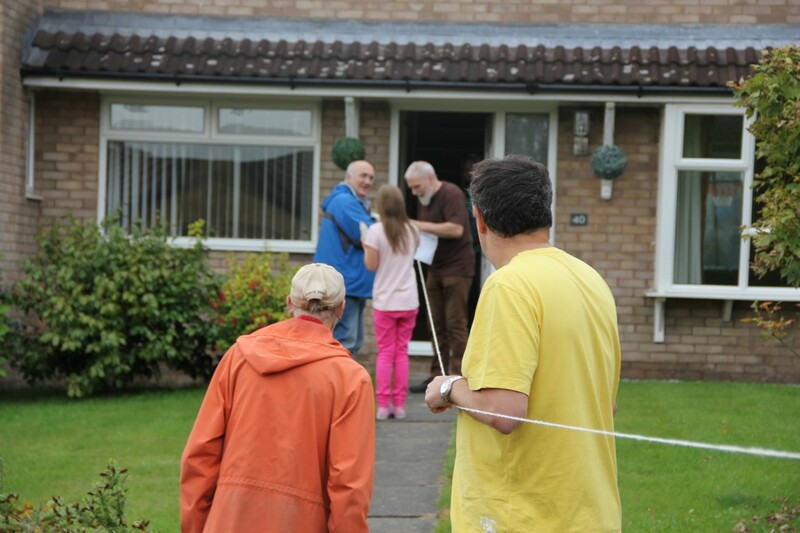 The issue of needing doorways in to socially engaged performance practice was expressed a few times; the need for a hook that appeals to a particular person or group of people. Within the city, traditional theatre buildings and performance spaces were often deemed to be unsuitable, having too many associations with a world apart from that of the community who is being engaged with. Several participants expressed a need for ‘new spaces’, ‘open spaces’ and ‘found spaces’ that do not come with a history of performance practice. Crossroads and roundabouts were added to the city, to illustrate how an artist navigates their own practice through the landscape, changing routes and approaches in relation to other people and outside influences. A few participants added bombs or mines – suggesting that the landscape was fraught with problems, such as cultural clashes, issues of commodification, ethical concerns, and problems around questions of skill and value. Also at the outskirts of this city were artists who don’t consider their work to be socially engaged, and community-led practices and subcultures not generally regarded as ‘art’, such as festivals, mumming, cheese-rolling, amateur dramatics, graffiti cultures, activism, pop-ups and small-scale gigs, etc. All of which were recognised as socially engaged forms of practice in their own right. Therefore, there was a tension around the defining and commodification of socially engaged practices, both in terms of how this de-values some groups and organisations, and places pressure for outcomes and impact on others. 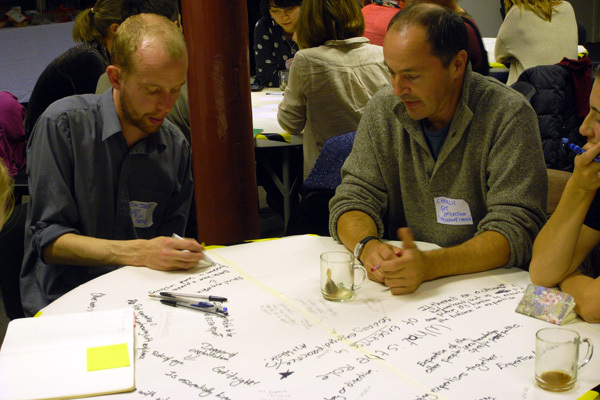 Table discussion Notes: Interactions, Leeds. 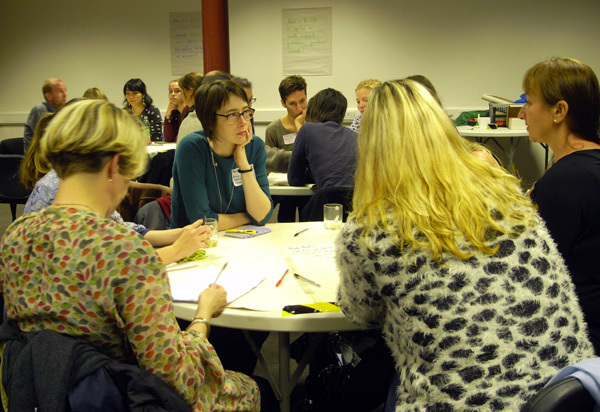 8th October 2014 (collated discussion and thinking from all the participants in dialogue with and written up by Gisele Bone). – What are the tensions that arise between social engagement and artistic practice – or are there any? 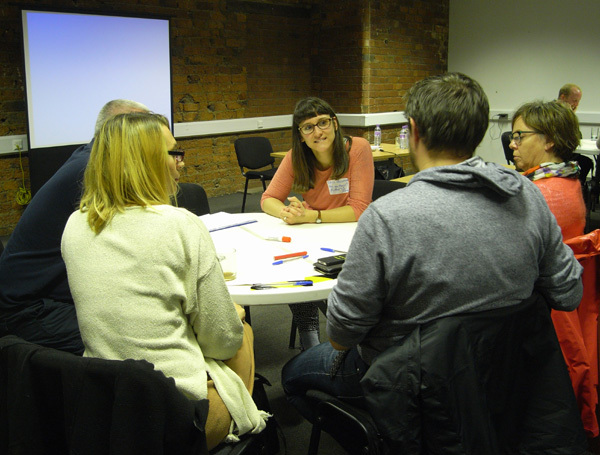 – How socially-engaged am I? – How can performance and public and objects interact? – How to keep artist’s integrity (if that matters) in socially collaborative work? – How can we make socially-engaged, socially responsible and responsive work without losing the meaning? – Who’s meaning? Who is making meaning? – What does socially-engaged dance look like? What is the difference / friction between ‘socially-engaged’ practice and (community) dance? WHAT ARE THE OPPORTUNITIES? – What new things am I going to hear tonight? And what can I contribute to the discussion? – Why do I need to consider social engagement in my practice? Solo practice? How about ‘socially-considered’? 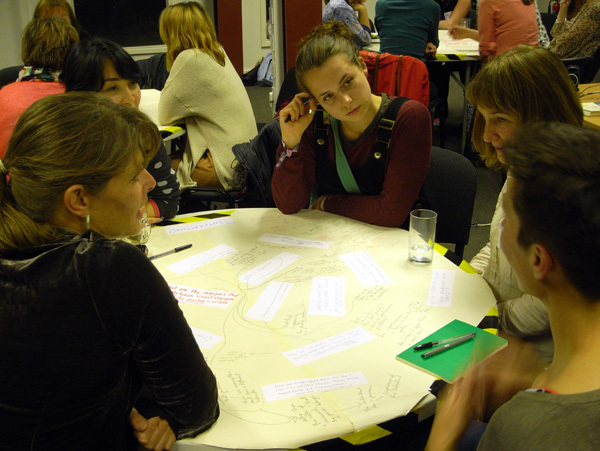 Am I engaging with the concerns of society – is that socially-engaged practice? Bored unless in stretch zone? Does it mean I have to work with somebody? Does it have to mean there’s a social issue? How can we make work that changes culture? Do we want to change culture? Who decides what to change? What’s ‘power’ all about? (‘Empowerment’ is a condescending term) ‘Engagement’ – who for / why / how? 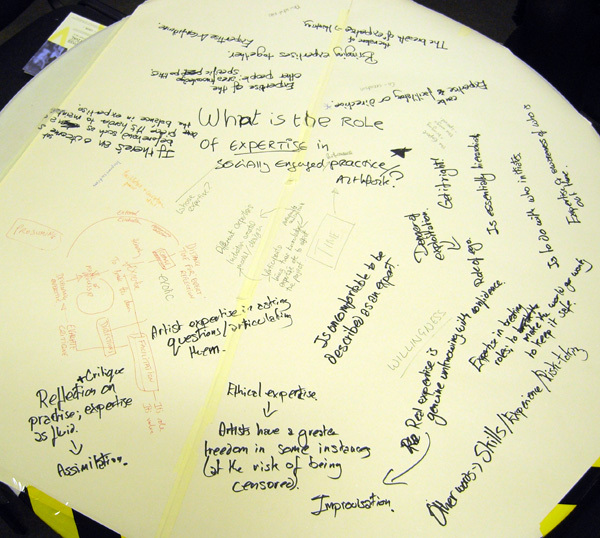 What is the role of expertise in socially engaged performance practice / artworks? 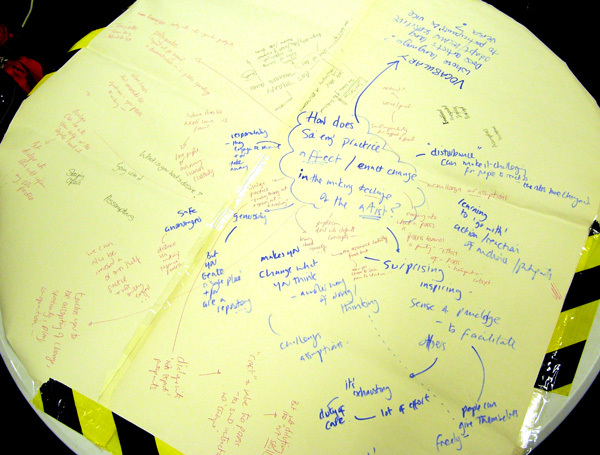 (collated discussion and thinking from all the participants in dialogue with and written up by Tim Jeeves). Perhaps unsurprisingly, in the discussions had around this question, a theme that kept being returned to was around hierarchy and its implications – particularly when working with groups of non-artists – once someone was labelled an ‘expert’. In part, we negotiated this by observing that there are many different kinds of expertise brought in to any project, and it is important to recognise the value to be found alongside the expertise of the art practitioner; i.e. the expert knowledge of a local area, having a particular identity, understanding a particular issue through lived experience. We talked about how the different expertises are blended together through the making of the work. Though there may be a very clear hierarchy within a particular field of expertise, in the mix of the different forms, this structural inequality would get problematised and challenged. Words that were used to describe the artists role in this blending included: facilitation, direction, curation and co-creation. Whilst making this mix is challenging enough to achieve in the context of a project, it is also worth remembering that the societal context – and its systems for attributing cultural capital – are also significant. The artist who facilitates a powerful artwork for social change is likely to be more rewarded in that broader society – both financially and in terms of status and reputation – than the LGBTQ participants that informed the work with their experiences. Inevitably, with so many artists participating in the discussion, whilst the variety in expertise was constantly returned to, when it came to the specifics of our own experience, we would often talk about artistic expertise. The link between expertise and confidence was also noted. Expertise does – to a degree – inspire confidence. If someone walks into a room and baldly states that they don’t know what’s going on, then it is easy for them to lose the trust of the group. Inversely, if an artist feels ill-equipped to deal with the inevitable mishaps or a shortage of time when there is a very fixed outcome to be working towards, then there is a risk that they may fall back on to a short-hand of expertise to solve things in a less than fulfilled manner. When expertise is utilised successfully, a key element would appear to do this whilst unknowing, albeit with confidence. We felt that many of the dangers of expertise are related to the ego, but were also careful to remember that there are positives to it as well. In spite of any risks, expertise, and its isolationary aspects, offers positive contributions to socially engaged practice as well. – refer to alternative / progressive / radical practice performed elsewhere that perhaps someone else – not an expert in the field of performance / art – wouldn’t be aware of. They have access to a range of knowledge-based tools. – spend time thinking on relevant issues – they might have ethical expertise, or expertise in articulating and asking difficult questions in new ways. – break rules: they can make the world go wonky whilst keeping it safe. Artists have greater freedom in some instances (i.e. someone who works within an institution) though it is important to remember that they are still under pressures and the risk of self-censorship is a real one. Expertise is not a fixed thing that someone ‘has’. It is fluid; it grows by assimilating previous work and experiences into a practice. It becomes something different from what it currently is through reflection and critique of practices.